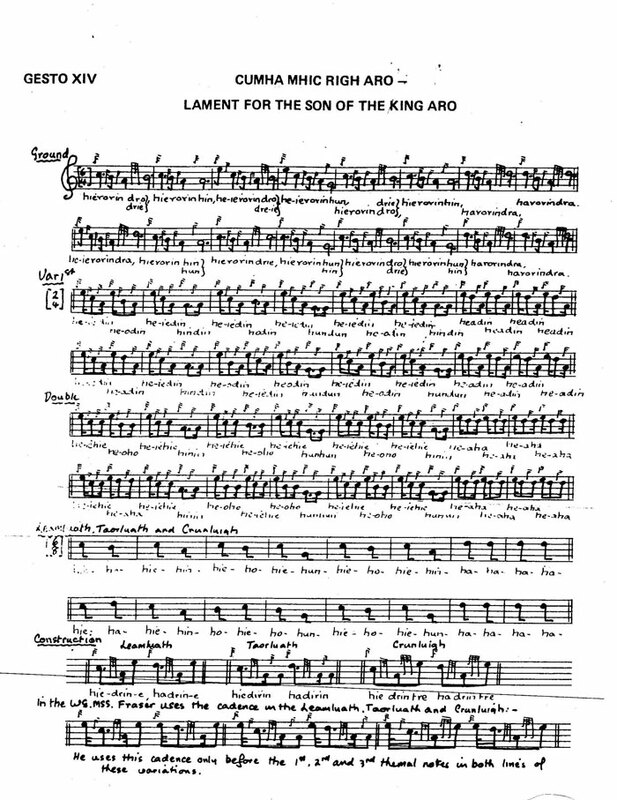 In my last post I mentioned a piobaireachd I have been learning called Lament for the Son of King Aro. As I was promised by the very helpful Mr. John Dow of the Piobaireachd Society, I received the “setting” of the tune, which Andrew Wright supplied to them (the link to Andrew Wright’s recording, above, is the only recording I’m aware of for that tune). Apparently it was published in only one collection (Simon Fraser), which is now next to impossible to find. Getting the setting for this tune is a tribute to the possibilities of the Internet, and people’s willingness to use it as a real form of communication and sharing information (as opposed to simply crass commercialism, which so much of the time it seems dominates the medium). I’m definitely no expert on piobaireachd, but I have listened carefully to many of the hundreds available on recordings. This one strikes me as much different from any I have heard, primarily in that its urlar (theme, shown as “ground” on the setting) is unusually lyrical, rhythmic, and “catchy.” The tune is also very short compared to many, lasting only about six minutes. But who was King Aro, and what happened to his son to warrant a lament? 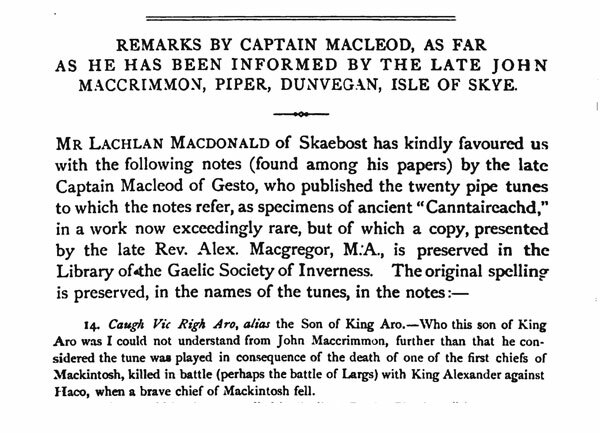 The tune is attributed, at least on the setting I have, to Gesto XIV, which I found to be one John MacLeod (pronounced “mac cloud”), born around 1722 and died sometime after 1782. Gesto was the name of the land his family inhabited on the Isle of Skye, in the northwest part of the island near a town called Waternish, close to Dunvegan, which is kind of like Ground Zero for piobaireachd as far as I can tell. I was hoping to find a quick and easy relationship between the composer and the subject of his tune that would explain who King Aro was. That didn’t happen. Back to Wikipedia, which has a brief post on the Aro Confederacy, which existed in southeastern Nigeria from 1690 to 1902. Nigeria during that time was one of many portals for the Transatlantic slave trade, and the Aro Confederacy apparently became a prominent middle man in that endeavor. The end of the confederacy came in 1902 under “pressure” from the British colonial effort, but the Aro – a subgroup of the Igbo – still exist today and still have a king, known as Eze Aro. Was Gesto XIV privy to a story about a Scots-Aro relationship in which a lamentable tragedy befell the son of Eze Aro? If so, what could the connection be and how did this unlikely subject enter the piobaireachd realm? Ancestry.com tells me that Aro is a surname common in Scandinavia and makes no mention of the Aro in Nigeria. There are clear links between Scottish history and Scandinavia, and there is a town on the northwest coast of Norway called Aro. On the surface this would appear a much likelier link than the one in Africa but a web search yields nothing about a king, or much else. Finally, after looking more closely at the setting of the tune, I thought searching for the Gaelic “Righ Aro” (King Aro) might get me somewhere. Bingo. Thanks to Google’s library book digitization project I found one result for “righ aro” that referred to a note published on page 435 of the July 1883 issue of Celtic Magazine. It refers to the same tune but with a slightly different Gaelic title, and suggests that the tune laments the death of one of the first Mackintosh chiefs, “perhaps at the battle of Largs” which occurred in October 1263 between the armies of Norway and Scotland on the Firth of Clyde. Despite this “find,” I still don’t know who King Aro or his son were. Many piobaireachd laments refer to battle vanquished figures in Scottish or Gaelic history. Perhaps this is simply another such story. Still, it would be interesting to know whether the lament was over a tragic death or if it was more tongue in cheek or ironic, as some piobaireachd titles are (such as “Too Long In This Condition,” which sounds like a Gaelic version of a typical blues song but actually – according to the authorities – referred to the fact that the tune’s composer couldn’t get a drink to save his life at a dinner party he was invited to). Scots actually do have a sense of humor, even – or especially – in serious matters. Perhaps the Lament for the Son of King Aro refers to a misfortune the unnamed child experienced during potty training, or he soiled his kilt in the face of an approaching spear-yielding Norwegian. Is the mystery sealed by the evaporation of time, or am I just not using the right search terms? This entry was posted on Friday, January 8th, 2010 at 12:06 am	and tagged with Andrew Wright, bagpipe music, ceol mor, Lament for the Son of King Aro, piobaireachd and posted in Piobaireachd, Scottish culture. You can follow any responses to this entry through the RSS 2.0 feed.